Joe McCreary has been a metal artist and educator for more than two decades. During that time he has exhibited his work in solo and group shows and has been included in several permanent collections. McCreary was artist-in-residence at Sloss Furnaces National Historic Landmark for 12 years. Visitors to UA campus know McCreary’s work through Goldie 1971, part of the Woods Quad Sculpture Garden, in the collection of the UA College of Arts and Sciences. For the past 15 years, McCreary has introduced artists to the process of casting through his introductory sculpture classes at The University of Alabama and at the University of Alabama at Birmingham. He has been a visiting artist at Birmingham-Southern College, Alfred University and UAB. McCreary holds an MFA in sculpture from The University of Alabama and a BA in art education from the University of Southern Mississippi. His work deals with issues of scale, history, food and humor. 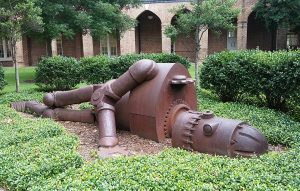 His sculpture, Goldie 1971, familiar to thousands of visitors to the University of Alabama campus, has been written about in Atlas Obscura, Deep Fried Kudzu and Roadside America, as well as AL.com (The story behind UA’s fallen robot with friendly, Frankenstein-esque face) and Birmingham Magazine.